Hyderabad – March 29, 2019 : We are proud to inform that Intense Technologies has been featured as one of the ‘10 Most Rewarding CEM Solution Providers To Go For In 2019’ by Mirror Review magazine. The list comprises of the top Customer Experience Management (CEM) solution providers across the world who have the most innovative solutions that focus on enhancing customer experience and increasing revenues for their enterprises. As mentioned by Mirror Review, digitalization of business processes has brought new ways of interaction between customers and enterprises, taking customer experience to a whole new level and making Customer Experience Management (CEM) as the center stage for every organization. Keeping this as the primary focus, Intense Technologies’ platform UniServe™ NXT is engineered to use an outside-in approach that puts customers first, making it customer-centric. It does this by giving the freedom to create, manage, scale, and evolve rapidly and dynamically by integrating into their client’s current system flawlessly without replacing existing IT infrastructure. The platform also automates the process of customer acquirement & engagement and delivers first-rate customer experience. 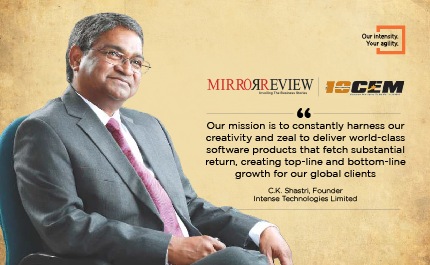 "Our mission is to constantly harness our creativity and zeal to deliver world-class software products that fetch substantial returns, creating top line and bottom line growth for our global clients" says C. K. Shastri, the Founder of Intense Technologies.